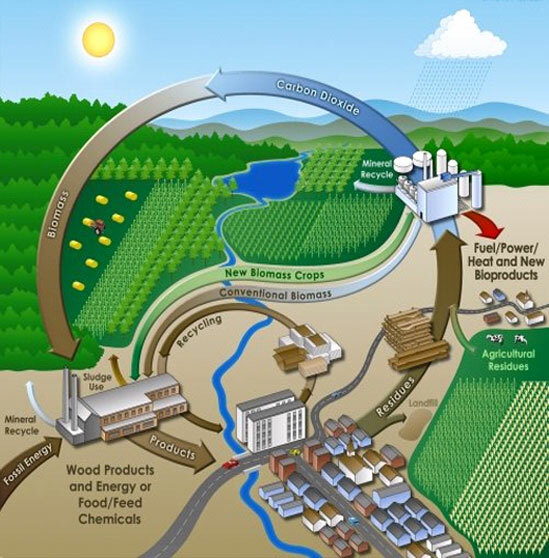 A biorefinery is a facility that integrates biomass conversion processes and equipment to produce fuels, power, and value-added chemicals from biomass. Biorefinery is analogous to today’s petroleum refinery, which produces multiple fuels and products from petroleum. By producing several products, a biorefinery takes advantage of the various components in biomass and their intermediates, therefore maximizing the value derived from the biomass feedstock. A biorefinery could, for example, produce one or several low-volume, but high-value, chemical products and a low-value, but high-volume liquid transportation fuel such as biodiesel or bioethanol. At the same time, it can generate electricity and process heat, through CHP technology, for its own use and perhaps enough for sale of electricity to the local utility. The high value products increase profitability, the high-volume fuel helps meet energy needs, and the power production helps to lower energy costs and reduce GHG emissions from traditional power plant facilities. There are several platforms which can be employed in a biorefinery with the major ones being the sugar platform and the thermochemical platform (also known as syngas platform). 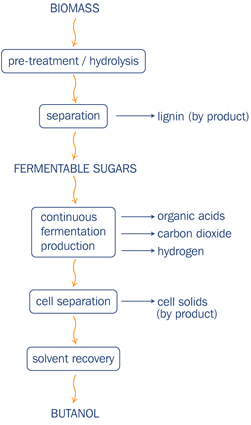 Sugar platform biorefineries breaks down biomass into different types of component sugars for fermentation or other biological processing into various fuels and chemicals. On the other hand, thermochemical biorefineries transform biomass into synthesis gas (hydrogen and carbon monoxide) or pyrolysis oil. The thermochemical biomass conversion process is complex, and uses components, configurations, and operating conditions that are more typical of petroleum refining. Biomass is converted into syngas, and syngas is converted into an ethanol-rich mixture. However, syngas created from biomass contains contaminants such as tar and sulphur that interfere with the conversion of the syngas into products. These contaminants can be removed by tar-reforming catalysts and catalytic reforming processes. This not only cleans the syngas, it also creates more of it, improving process economics and ultimately cutting the cost of the resulting ethanol. Biorefineries can help in utilizing the optimum energy potential of organic wastes and may also resolve the problems of waste management and GHGs emissions. 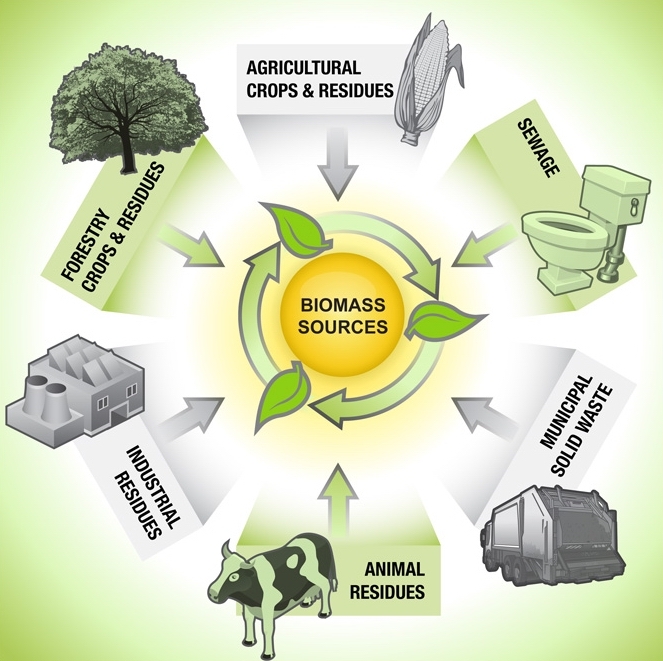 Biomass wastes can be converted, through appropriate enzymatic/chemical treatment, into either gaseous or liquid fuels. The pre-treatment processes involved in biorefining generate products like paper-pulp, HFCS, solvents, acetate, resins, laminates, adhesives, flavour chemicals, activated carbon, fuel enhancers, undigested sugars etc. which generally remain untapped in the traditional processes. The suitability of this process is further enhanced from the fact that it can utilize a variety of biomass resources, whether plant-derived or animal-derived. The concept of biorefinery is still in early stages at most places in the world. Problems like raw material availability, feasibility in product supply chain, scalability of the model are hampering its development at commercial-scales. The National Renewable Energy Laboratory (NREL) of USA is leading the front in biorefinery research with path-breaking discoveries and inventions. Although the technology is still in nascent stages, but it holds the key to the optimum utilization of wastes and natural resources that humans have always tried to achieve. The onus now lies on governments and corporate sector to incentivize or finance the research and development in this highly promising field. The major techno-commercial limitations of existing biofuels has catalyzed the development of advanced biofuels such as cellulosic ethanol, biobutanol and mixed alcohols. Biobutanol is generating good deal of interest as a potential green alternative to petroleum fuels. It is increasingly being considered as a superior automobile fuel in comparison to bioethanol as its energy content is higher. The problem of demixing that is encountered with ethanol-petrol blends is considerably less serious with biobutanol-petrol blends. Besides, it reduces the harmful emissions substantially. It is less corrosive and can be blended in any concentration with petrol (gasoline). Several research studies suggest that butanol can be blended into either petrol or diesel to as much as 45 percent without engine modifications or severe performance degradation. Biobutanol is produced by microbial fermentation, similar to bioethanol, and can be made from the same range of sugar, starch or cellulosic feedstocks. The most commonly used microorganisms are strains of Clostridium acetobutylicum and Clostridium beijerinckii. In addition to butanol, these organisms also produce acetone and ethanol, so the process is often referred to as the “ABE fermentation”. The main concern with Clostridium acetobutylicum is that it easily gets poisoned at concentrations above 2% of biobutanol in the fermenting mixture. This hinders the production of bio-butanol in economically viable quantities. In recent years, there has been renewed interest in biobutanol due to increasing petroleum prices and search for clean energy resources. Researchers have made significant advances in designing new microorganisms capable of surviving in high butanol concentrations. The new genetically modified micro-organisms have the capacity to degrade even the cellulosic feedstocks. Biobutanol production is currently more expensive than bioethanol which has hampered its commercialization. However, biobutanol has several advantages over ethanol and is currently the focus of extensive research and development. There is now increasing interest in use of biobutanol as a transport fuel. As a fuel, it can be transported in existing infrastructure and does not require flex-fuel vehicle pipes and hoses. Fleet testing of biobutanol has begun in the United States and the European Union. A number of companies are now investigating novel alternatives to traditional ABE fermentation, which would enable biobutanol to be produced on an industrial scale. The Middle East and North Africa (MENA) region offers almost 45 percent of the world’s total energy potential from all renewable sources that can generate more than three times the world’s total power demand. Apart from solar and wind, MENA also has abundant biomass energy resources which have remained unexplored to a great extent. According to conservative estimates, the potential of biomass energy in the Euro Mediterranean region is about 400TWh per year. Around the region, pollution of the air and water from municipal, industrial and agricultural operations continues to grow. The technological advancements in the biomass energy industry, coupled with the tremendous regional potential, promises to usher in a new era of energy as well as environmental security for the region. The major biomass producing countries are Egypt, Yemen, Iraq, Syria and Jordan. Traditionally, biomass energy has been widely used in rural areas for domestic purposes in the MENA region, especially in Egypt, Yemen and Jordan. 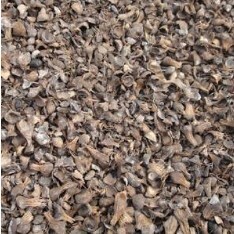 Since most of the region is arid or semi-arid, the biomass energy potential is mainly contributed by municipal solid wastes, agricultural residues and industrial wastes. Municipal solid wastes represent the best source of biomass in Middle East countries. Bahrain, Saudi Arabia, UAE, Qatar and Kuwait rank in the top-ten worldwide in terms of per capita solid waste generation. The gross urban waste generation quantity from Middle East countries is estimated at more than 150 million tons annually. Food waste is the third-largest component of generated waste by weight which mostly ends up rotting in landfill and releasing greenhouse gases into the atmosphere. The mushrooming of hotels, restaurants, fast-food joints and cafeterias in the region has resulted in the generation of huge quantities of food wastes. 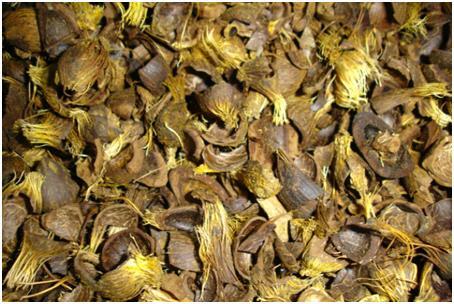 The food processing industry in MENA produces a large number of organic residues and by-products that can be used as biomass energy sources. In recent decades, the fast-growing food and beverage processing industry has remarkably increased in importance in major countries of the region. Since the early 1990s, the increased agricultural output stimulated an increase in fruit and vegetable canning as well as juice, beverage, and oil processing in countries like Egypt, Syria, Lebanon and Saudi Arabia. The MENA countries have strong animal population. The livestock sector, in particular sheep, goats and camels, plays an important role in the national economy of respective countries. Many millions of live ruminants are imported each year from around the world. In addition, the region has witnessed very rapid growth in the poultry sector. The biogas potential of animal manure can be harnessed both at small- and community-scale. Disposal of cooking oil is not an easy task. If you try to drain it, it will block your sink drains and cause you immense plumbing problems. Throwing it away is also not a good idea because it causes damage to the environment. Cooking oil cannot go to your usual recycle trash bin like other trash because the processes of recycling it are different. However, there are better ways of recycling cooking oil without harming the environment. You can have it recycled. If you are not able to do it by yourself, there are companies that offer cooking oil recycling services. Recycling companies, like MBP Solutions, turn cooking oil into other products like stock feed, cosmetics and biofuel. They also filter the oil for reuse. If you are not in any position to recycle your cooking oil, do not drain it down the sink or throw it in your waste bin. Wrap your cooking oil in a tight jar, make sure there are no spills and call the right people to come and collect it. MBP Solutions recycles both commercial and residential cooking oils. Recycling cooking oil comes with several benefits. The technology used to recycle the oil is advanced and the final products help in both businesses and homes. Recycling cooking oil turns it into renewable energy used in many manufacturing firms for processing their products. 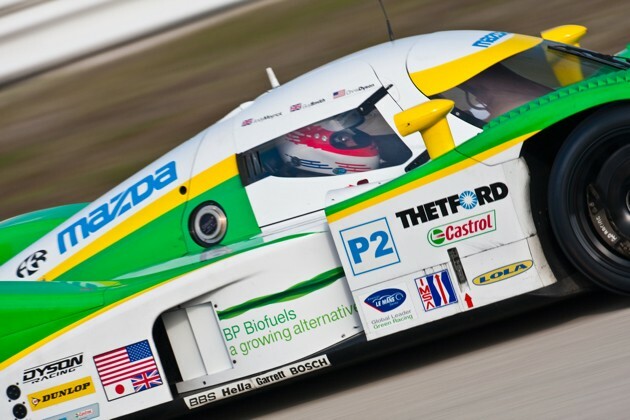 One of the most notable fuels is biodiesel, which is from used oils, grease, animal fats and vegetable oils among others. Vehicles that use diesel can use this fuel effectively and businesses that use diesel-powered machines can use the fuel without any fear of harmful emissions. We all need a clean environment and it is not what we always get. Fuels are some of the major contributor to health hazards because of emissions. Petro-diesel is very toxic as compared to biodiesel. Biodiesel is eco-friendly and does not damage a vehicle’s engine. Petro-diesel on the other hand, produces chemical compounds like sulphur that are acidic. This acid can spoil the engine. Biodiesel is a result of green technology and keeps everything safe. Recycling cooking oil saves costs in many ways. At home, you can reduce your disposal costs by calling a recycling company to come for your waste oil. If you try to dispose of the oil by yourself, you may end up spending more on extra waste bins, transportation and special disposal procedures. Companies that use recycled oil have a chance of preventing their equipment from spoiling faster than they did before the recycled oil. Maintenance costs go down and recycled oil like biodiesel is much cheaper as compared to the other kinds of imported fuels. Disposing of waste materials and recycling them is one way of creating jobs for the masses. Instead of using that money to import petro-diesel, the government uses the money to employ more people to recycle oil into more beneficial biodiesel. You can make an extra buck out of disposing your used oil. Instead of throwing your oil away, look for companies that recycle the oil and pay you for it. This will also save you on transport costs to go and dispose of your oil, because the recycling companies come to pick it up. The most important factor about recycling is that we are working towards one goal. That goal is to maintain a greener, healthier and cleaner environment. That is our goal and recycling cooking oil is one way of doing that.